An information panel and plaques commemorate the site of the terminus of the first electric tramway to Doncaster, the first tramway in the Southern Hemisphere. The plaque was relocated to its present site in 1889. From October 1889 until January 1896, an electric tram ran between the Box Hill Post Office, on the corner of Whitehorse Road and Station Street, and a terminus near the intersection of Elgar and Doncaster Roads, Doncaster. It was the first electric tram in Australia, and the southern hemisphere, to operate as a regular service. 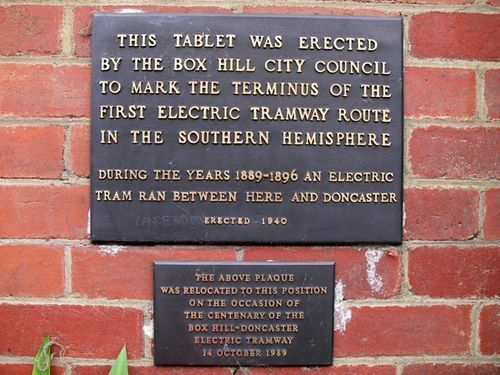 I am glad to see that the Box Hill City Council is about to mark with a bronze tablet the terminus of the first Australian electric tramway, which ran, with some interruptions, between Box Hill and Doncaster from October, 1889, until January, 1896. This memorial was suggested by the Historical Society, at the instance of Mr. J. K. Moir, who has published a pamphlet giving an interesting sketch of the tramway's history. Argus (Melbourne), 2 November 1940. Tram Ran Between Here And Doncaster.